The man. The marvel. The mustache. As one of the most versatile and prolific artists of the 20th century, Salvador Dali’s career spanned for over six decades. Celebrated for his paintings, prints, sculptures and visionary explorations in film, Dali is undoubtedly one of the most influential figures in modern art. His imaginative expression came from the great risks he took in both his personal and professional endeavors creativity. His works are easily recognizable for their eccentricity and unconventionality, thanks to his unquestionable ability to shake things up and take risks with his art. As a Here key figure in the Surrealist movement, he fearlessly proved how rich life can be when you dare to embrace the subconscious mind with boundless creativity. But just when you thought you knew everything there was to know about the famous Spanish draftsman, we created a list of facts that are every bit as over the top as the man himself. 1. Although he loved art, art school wasn’t for him. Young Dali’s love of art was fostered from the beginning by his beloved mother, but when she passed away when he was just 16, he didn’t handle it well His eccentric fashion sense and erratic behavior got him thrown out of the Fine Arts Academy in Madrid in 1923. He returned to the school three years later only to be expelled again because he felt he was infinitely smarter than his professors and wouldn’t sit for his oral exams. We don’t condone disrespect to professors, but truth be told, expulsion was probably the best thing that could ever have happened to Dali. That same year he traveled to Paris and befriended his idol Pablo Picasso. 2. He didn’t do drugs (seriously). One look at Dali’s art and it could easily be surmised that the artist dabbled in hallucinogenics, but the dude was just naturally “out there.” He didn’t need any chemical substances to alter his state and once famous said, “I don’t do drugs, I am drugs.” In the beginning part of the 1930s he developed the paranoiac-critical method, which deeply contributed to the Surrealist movement. This form of spurring creativity meant that he forced himself into a dreamlike state by fixating on an object until it distorted into another one. Deep, right? A prominent figured in Dali’s later works, particularly in the 1963 piece, “Portrait of my Dead Brother,” Dali believed he was the reincarnation of his older brother. Nine months before Dali was born, his older brother died and 5 years later when Dali’s parents took the young man to visit his brother’s grave, they told him he was his reincarnation. Dali already believed it and took the information as confirmation that his deceased sibling was “a first version” of himself. As much of a trickster as he was an artist, Dali once sold Yoko Ono a blade of grass from his backyard for $10,000. Yoko Ono asked Dali if she could purchase a strand of hair from his mustache, but he believed she was a witch and didn’t want her to have a personal item of his. But, still wanting the money, he decided to get creative and found a dry blade of grass to send her. Those that knew him well said he got a kick out of ripping her off. He and his wife Gala loved throwing elaborate dinner parties and inviting numerous guests over. They would often throw wild themes and encourage guests to come dressed according – from wild animals to circus clowns, the parties were always over the top. In the early 1970s, Dali even published a cookbook with over-the-top recipes like, toffee covered pine cones and stuffed snail. The artists were fans of each other. In the beginning of his career, Alice Cooper’s stage shows modeled the works of Dali. Impressed and equally sharing admiration, Dali frequented Cooper’s shows because he felt as though “his art was coming to life.” When Cooper was 25 and Dali was 69, the two used Cooper as a model and collaborated to create the world’s first ever living hologram. Additionally, Dali presented Cooper with The Alice Brain, a ceramic sculpture he created in honor of the singer. Part cheapskate, part trickster, Dali paid for his meals with art. After a meal, when the bill came, Dali would spend a few minutes doodling artwork on the back of his check. The art was so good, complete with his autograph, Dali knew that no restaurant owner would ever actually cash the check. This worked so often for Dali that he choose to go out for meals more than he ate in because he always ate for free. In the 1969s, the mayor of Figueres, asked Dali if he would donate a piece of art to the local museum. Instead, Dali thought it would be more appropriate to transform the town’s theater, one that had been unusable since the Spanish Civil War, into a Dali Museum and Theater. Even after it opened in 1974, Dali continued to add art and expand on the collection until his final years. Upon his death, they buried him under the theater’s stage. To this day, the museum and theater draw in over a million visitors a year to see all the vast collection of works. 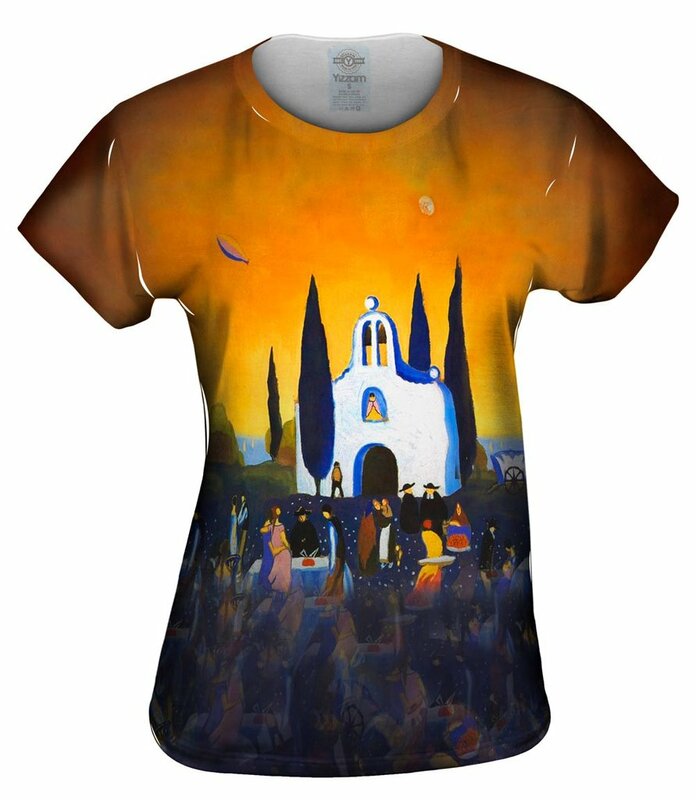 The good news is, you don’t have to make the trek to Figueres and head to the Dali museum gift shop to get all over print Salvador Dali apparel. 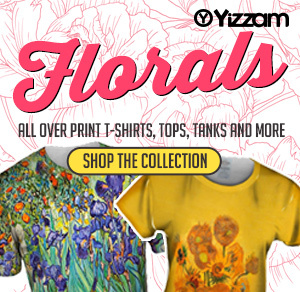 We have everything you’re looking for in our very own Yizzam Salvador Dali collection of all over print t-shirts, hoodies, tanks, and leggings. 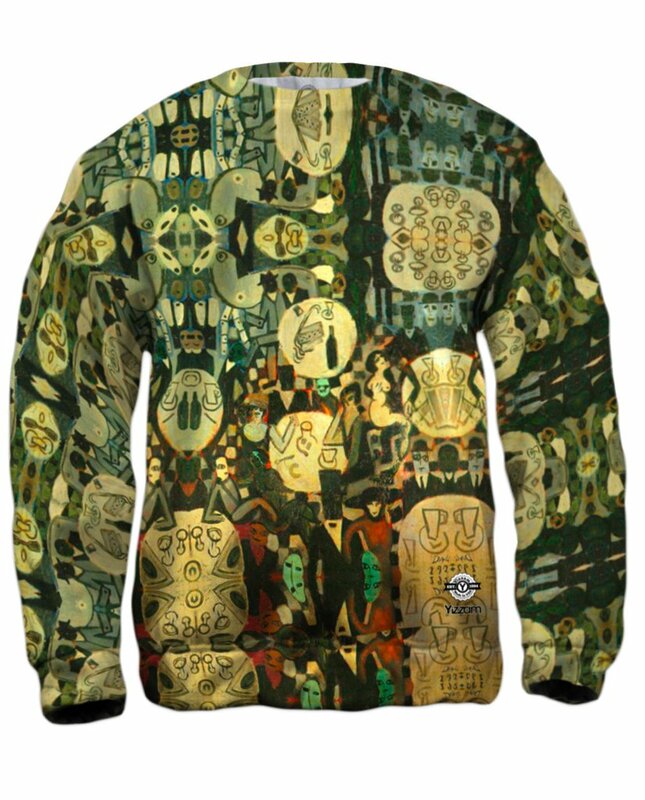 Here are a few favorites from this Surrealist collection. A unique cubist experiment, this painting was the beginning of the Spanish surrealist’s impressionist work. Inspired by Pablo Picasso, this 1922 piece was done just before being thrown out of art school. 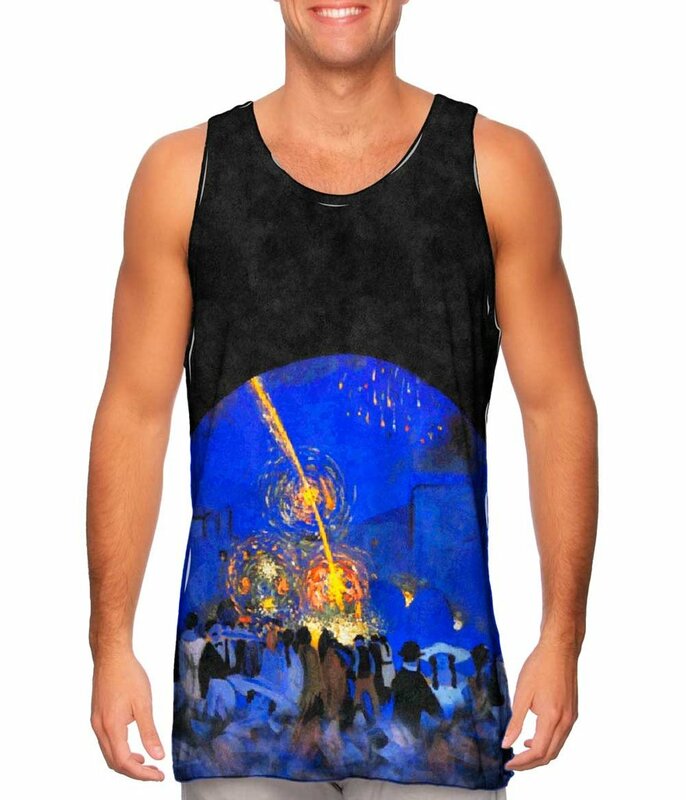 Originally done as an oil painting, this print is sure to become one of your wardrobe staples. Symbolizing a pilgrimage to Figueres, Dali’s birthplace, this colorful and unique print is a beautiful look inside Dali’s love for his home. Dreamlike and poetic, this painting makes for a perfect day or night look. Whatever you are celebrating, this all over print tank is ready to party with you. Full of bold color, this famous painting turned print, is another homage to Dali’s beloved home.